Having received its third reading in one House, a bill is sent to the other House where it passes through all the stages once more. Financial legislation is not scrutinised in detail by the Lords. The passage through the second House is not a formality, and bills can be further amended. Amendments made by the second House must be agreed by the first, or a compromise agreement reached, such that both Houses have agreed the same text, before a bill can receive Royal Assent. Bills with contentious amendments pass back and forth between the Houses before agreement is reached. If each House insists on its amendments, a bill may be lost. Most government bills introduced and passed in the Lords pass through the Commons without difficulty, but a bill from the Lords which proved unacceptable to the Commons would not become law. The Lords do not generally prevent bills from the Commons becoming law, although they will often amend them and return them for further consideration by the Commons. 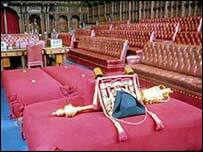 The assent of the Lords is not essential, subject to certain conditions, in the case of 'money bills'. Bills dealing solely with taxation or expenditure must become law within one month of being sent to the Lords. If, after the process of considering amendments, it proves impossible to reach agreement on a non-financial bill, then the bill may be lost. Alternatively, the Commons can use its powers to present a bill originating in the House of Commons for Royal Assent after one year and in a new session, even if the Lords' objections are maintained. These limits to the powers of the Lords are contained in the Parliament Acts of 1911 and 1949. They are based on the belief that the main legislative function of the non-elected House is to act as a chamber of revision, complementing but not rivalling the elected House.